We place our children in car seats to keep them safe, yet these very car seats may be full of toxic chemicals that could make our children sick. A new report from the Ecology Center was released on Wednesday. “Car seats save lives. It’s absolutely essential that parents put their children in them while driving,” said Jeff Gearhart, the Ecology Center’s Clean Car Campaign Director. “However, some car seats are safer than others when it comes to chemical composition. Healthycar.org makes it easy for parents to choose the least toxic car seat for their child.” Chemicals tested for include: bromine (associated with brominated flame retardants); chlorine (indicating the presence of polyvinyl chloride, or PVC and plasticizers); lead; and heavy metal allergens. Such chemicals have been linked to major health problems such as liver, thyroid and developmental problems in children. Children have the highest exposure and are the most vulnerable population in terms of exposure to chemical-laden dust and inhaling toxic fumes, since their systems are still developing. The Ecology Center tested 62 brand new car seats, some of which tested very low for toxic content, while others were saturated. “The study found that the best seats had no brominated flame retardants, no PVC and low levels of other chemicals tested. Over 40% of seat cushions tested contained no brominated flame retardants and 77% of the seats were free of PVC-plastic. However, over 1/3 of all seats tested had one or more components which contained higher levels of toxic chemicals. 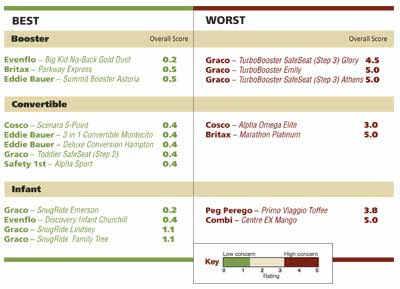 A complete ranking of all of the car seats that were tested can be found at www.healthycar.org.” Parents are advised to always leave a window cracked open in the car, to not use the car seat outside of the car to minimize exposure, and to avoid leaving the car seats in the sun. for my daughter. 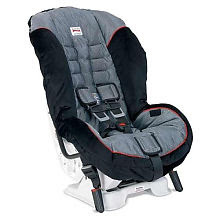 The Britax seat has more neck and head support, which I like for my three year old, but I don’t think my five year old daughter would be comfortable in this seat, as she is not use to such support. This is an extra expense I had not anticipated, but my children’s health is at stake. I am so tired and angry over the recent reports of toxic substances in children’s products, that I have been moved to start a petition to the Consumer Product Safety Commission (CPSC). Please sign the petition asking the CPSC to protect our children from toxins in car seats. Thank you Jeremiah of Z Recommends for alerting us to this issue! Is Your Child’s Car Seat Poisonous? 5/22 Update: I am returning our new car seats. The fumes from them are horrible, and I feel our older car seats are better, as hopefully they are done outgassing. Argh, I’m so tired of this! Carseats aren’t even up to the proper standards, and now they’re poisoning our children?! Thanks for the article. Luckily my car seat is one of the safe ones. I had no idea this was even an issue. Thanks so much!!! When will they issue out a recall,if they do? Good question. I doubt there will be a recall, since there hasn’t been one for BPA or lead in lunchboxes. We bought new car seats today.